Regular readers of this weblog might have wondered why, after 2012, 2013, 2014 and 2015, there was no blogpost on the 2016 ComFor (German Society for Comics Studies) conference. There is a simple reason for that: I hadn’t attended last year’s conference. Two weeks ago, however, I took the trip to Bonn where this year’s conference (topic: “Comics and their Popularity”) took place. 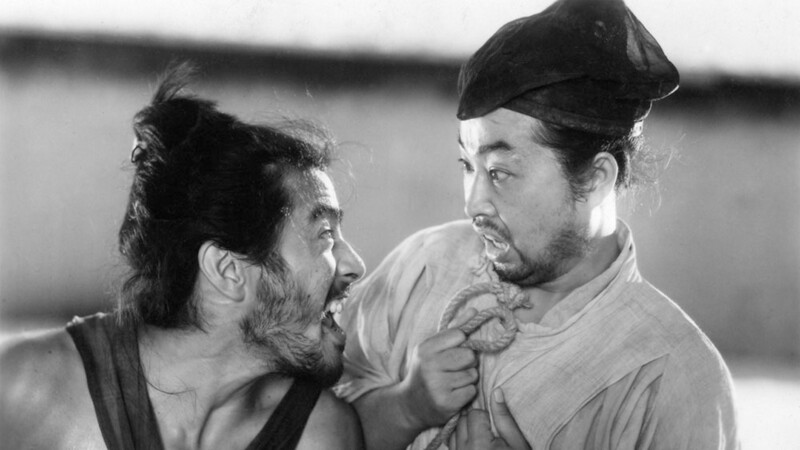 Please note that the following notes are not intended to adequately summarise the respective conference paper; instead they’re rather subjective and random – hence the title of this blogpost. The conference started on Friday, December 1 with the “Open Workshops”, i.e. papers outside of the conference theme of “Comics and their Popularity”. The first presentation was by Zita Hüsing (Bonn) on “Being and Nature: The Significance of the Southern Space of the Swamp in Alan Moore’s The Saga of the Swamp Thing” in which she put forward connections between tropes of the American South and Swamp Thing, e.g. 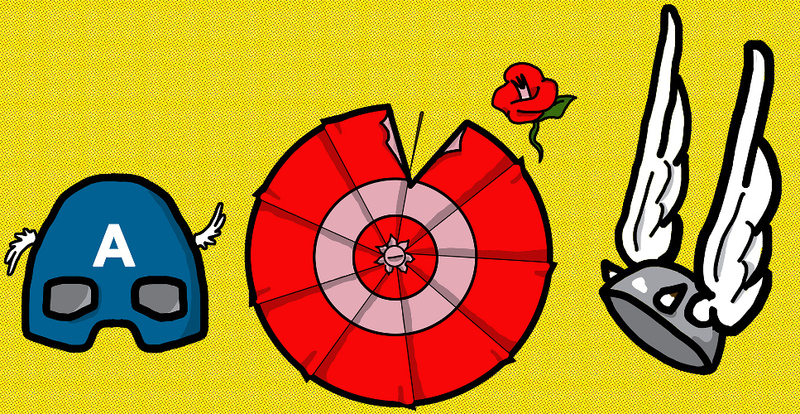 that both are hard to kill – no matter how badly they are maimed or burned down, they always come back from the dead. As was remarked in the discussion afterwards, however, it’s interesting how writers after Moore, such as Jeff Lemire, have expanded Swamp Thing’s backstory into a cosmology that shifts the focus from the local to the global. In the second paper, “Batwing, Batflügel oder Flügel-Bat. Die onimischen Einheiten im Comic” (“onimic units in comics” – all translations mine), Rafał Jakiel (Wrocław) looked at the names (poetonyms) of characters in superhero comics and identified characteristics such as their straightforward iconicity: for instance, Killer Croc is simply a murderous man who looks like a crocodile. Daniela Kaufmann (Graz) then presented “A Study in Black and White. Zur Signifikanz der Farben Schwarz und Weiß im Comic” (“on the significance of the colours black and white in comics”). Starting from Kazimir Malevich’s Black Square – featured e.g. in Nicolas Mahler’s comic Lulu und das Schwarze Quadrat – she proceeded to Krazy Kat and the racial ambiguity of both its creator George Herriman and its eponymous protagonist. This was followed by Elisabeth Krieber‘s (Salzburg) paper on “Subversive Female Performances in Visual Media – Phoebe Gloeckner’s and Alison Bechdel’s Graphic Narratives” which also considered the musical adaptation of Fun Home and the film adaptation of Diary of a Teenage Girl. Unfortunately I missed the next two talks by Karoline M. Pohl and Sakshi Wason, respectively, who closed the “Open Workshops” section after which the papers on the “Popularity” theme began. The next presentation I attended was by Véronique Sina (Cologne / Tübingen) on “Comickeit is Jüdischkeit. Über das diskursive Zusammenspiel von Comic, Populärkultur und jüdischer Identität” (“on the discursive interplay of comics, popular culture, and Jewish identity”). Her main examples were the comics of Aline Kominsky-Crumb and Harvey Pekar, and she also discussed Jonas Engelmann’s hypothesis of popular culture as the dissolution of identity. Pnina Rosenberg (Haifa) talked about “Mickey au camp de Gurs: Political criticism and auto censorship in comics done during the Holocaust”, in which she presented three picture books made by Hans Rosenthal during his internment at a concentration camp in 1942. The first keynote of the conference was given by Julia Round (Bournemouth), titled “Canon or Common? Sandman, Aesthetics, Intertextuality and Literariness”. She discussed the ongoing struggle about the status of comics in general and Sandman in particular as literature (also: high vs. low art, “graphic novels” vs. comic books), how this is affected by the Romantic author notion around Neil Gaiman (“Mr Gaiman is the Sandman” – Clive Barker), and how this discourse comes to the fore in fan discussions at neilgaimanboard.com. In his talk on “Batmans queere Popularität. Ein comicwissenschaftlicher und kulturhistorischer Annäherungsversuch” (“Batman’s queer popularity. An approach from the perspective of comics studies and cultural history”), Daniel Stein (Siegen) discussed how Batman is appropriated as gay by some readers, while others are gripped by ‘queer anxiety’, i.e. the fear that their beloved character might officially become gay. Laura Antola‘s (Turku) paper “Marvel’s Comics in Finland: Translation, ‘Mail-Man’ and the popularity of superheroes” portrayed the eccentric figure of ‘Mail-Man’, a real-life translator and editor who also answered fan mail in the letter pages of Finnish Marvel comics from 1980 onward. “Das Popula(e)re und das Signifikante. Der Comic als Antwort auf die Krise liberaler Erzählungen?” (“The popular and the significant. Comics as an answer to the crisis of liberal narratives?”) by Mario Zehe (Leipzig) discussed Economix by Goodwin/Burr, Le Singe de Hartlepool by Lupano/Moreau, and Lucky Luke: La Terre promise by Jul/Achdé as examples of comics that show the limits of cosmopolitanism. Stephan Packard (Cologne) talked about “President Lex Luthor, Wakanda und der osteuropäische Schwarzwald. Zur populären Ideologie der Fiktionalität in Comics” (“President Lex Luthor, Wakanda and the Eastern European Black Forest. On the popular ideology of fictionality in comics”) and the sometimes problematic connection between fictional things and their real-world counterparts. A striking example is the recent “Alien Nation” story from Captain Marvel vol. 1 (2017) which is partly set in the “Black Forest”, albeit a Black Forest that doesn’t look anything like the real one in South Western Germany and is located, according to a caption, in “Eastern Europe”. Packard unfolded a compact theoretical framework which included the categories of fiction theory discussed by Marie-Laure Ryan such as the ‘principle of minimal departure’, but also Theodor Adorno’s ‘categorical imperative of the culture industry’, among others. The next paper was David Turgay‘s (Landau) highly interesting “Das Alternative im Populären: Eine korpusgestützte Analyse von Mainstream-Comics” (“the alternative in the popular: a corpus-based analysis of mainstream comics”) in which he examined the panels of 150 American comic books from 1996 and from 2016 with regard to six criteria: politics / social criticism, narrative peculiarities, artistic peculiarities, metafictional elements, absence of fighting, and absence of text. The results of the analysis showed a significant increase of these criteria over time, but overall these characteristics (which David Turgay interpreted as the influence of independent comics) still occurred less often in 2016 than expected. In his presentation on “Der Fluch der Graphic Novel aus (hochschul)didaktischer Sicht” (“the curse of the graphic novel from the perspective of (tertiary) education”), Markus Oppolzer (Salzburg) discussed the dreaded g-word again, but he also mentioned Conan the Librarian from the film UHF – as a librarian myself, I can’t believe I had never heard of him before! Dietrich Grünewald (Reiskirchen) talked about “Grenzgänger. Comics und Bildende Kunst” (“border crossers. Comics and fine art”) and how fine art such as paintings are used in comics, e.g. as background details in Volker Reiche’s Strizz. Christian A. Bachmann‘s (Bochum) contribution was probably the one with the longest title: “Slippers and music are very different things, oder: von high key to low key. Zur Darstellung populärer Musik in Bildergeschichten des 19. und Comics des frühen 20. Jahrhunderts” (“from high key to low key. On the depiction of popular music in picture stories of the 19th and comics of the early 20th century”). Among his examples were Billy DeBeck’s Barney Google and Richard F. Outcault’s Buster Brown. Kirsten von Hagen (Gießen) presented a paper on “Tintin und die Recherche: Von der ‘ligne claire’ Hergés zu den synästhetischen Traumsequenzen bei Heuet” (“Tintin and the recherche: from Hergé’s ‘ligne claire’ to Heuet’s synesthetic dream sequences”). Stéphane Heuet adapted Marcel Proust’s In Search of Lost Time as a series of comic volumes using a ligne claire style. Martin Lund (Växjo / New York) gave the second keynote on “Jack T. Chick, a Popular Propagandist”. With over 260 ‘Chick tracts’ since 1961 of which an estimated 900 million copies have been distributed, Chick might have been “the most widely distributed comics creator in the world” (Darby Orcutt 2010 – but see also https://en.wikipedia.org/wiki/List_of_best-selling_comic_series). Chick’s comics are a wellspring of knowledge on topics such as evolution, abortion and climate change; for instance, did you know that “global warming experts pray to Ixchel“, the Mayan “goddess of the moon and creativity”? But seriously: according to Martin Lund, the Chick tracts were never intended to convert unbelievers to Chick’s twisted beliefs, but rather to reassure those people who already were on his side. Michael Wetzel‘s (Bonn) paper was titled “‘Graphic Auteurism‘: Von Kreativität und Copyright im Comic” (“On creativity and copyright in comics”). An interesting hypothesis was that the popular concept of a ‘Romanticist notion of authorship’ is flawed because Romanticist authors such as E. T. A. Hoffmann actually deconstructed authorship. Next was Joachim Trinkwitz (Bonn), one of the two conference organisers together with Rolf Lohse, on “Auteur-Serien im Comic” (“auteur series in comics”) and their different forms as magazine serialisations and collected editions, using the examples of V for Vendetta, Black Hole, and Jimmy Corrigan. Lukas R. A. Wilde (Tübingen) then gave the only paper of this conference that was (at least partially) about manga. Titled “Public Domain Superheroes, Jenny Everywhere und dōjinshi. Die Comic- und Manga-Figur als meta-narrativer Knotenpunkt der Partizipationskultur” (“The comic and manga character as meta-narrative node of participatory culture”), it presented the niji sōsaku / sanji sōsaku cycle (dōjinshi based on official franchises, dōjinshi based on dōjinshi, …), ‘Second Order Originals’ (detextualised characters such as Sherlock Holmes), the concept of Open Source characters (e.g. Jenny Everywhere), the kyara-kyarakutā distinction, and a new “participatory kyara” from the political far-right in Germany named AfD-chan. 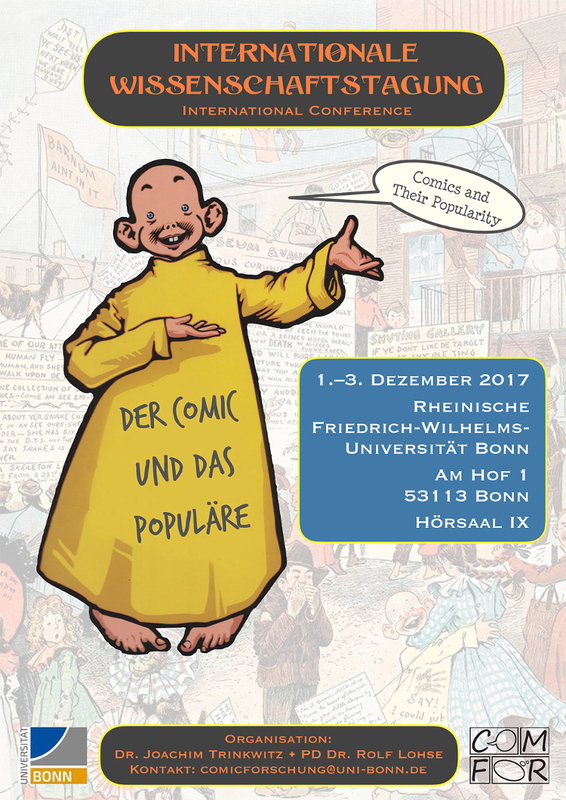 The last talk of this year’s conference was given by Jörn Ahrens (Gießen) on “Der Comic ist das Populäre. Zur populärkulturellen Gestalt eines Mediums der Massenkultur” (“The comic is the popular. On the popular cultural shape of a mass culture medium”) which examined the reception of 100 Bullets in a review of The Comics Journal and the problematic implicit notion therein of what ‘quality’ comics should be. In comparison to previous ComFor conferences I attended, I had the impression there were more papers on superhero comics, but there were definitely even less on manga. Then again, I guess the organisers simply didn’t receive more submissions on manga, so it’s up to all manga researchers to do something about this skewed manga/non-manga ratio next year. Another point about the programming that’s always somewhat problematic is the integration of conference papers in English: this year there were 7 out of 24 papers given in English which were distributed among Friday and Saturday, so it must have been unattractive for non-German speakers to attend the conference. It will be interesting to see if the ComFor conferences can improve in the areas of both comics internationalisation and attendee internationalisation in the years to come. Rik Spanjers spoke about Shigeru Mizuki’s Onward Towards Our Noble Deaths. In this classic manga set in the Pacific War (as well as in his other manga), Mizuki employs a distinctive art style in which cartoonish characters clash with photorealistic backgrounds. Spanjers explains this art style with Mizuki’s attempt to adequately represent the horrors of war. For instance, the opposition between these two distinct art styles mirrors the opposition between life and death in the story, etc. 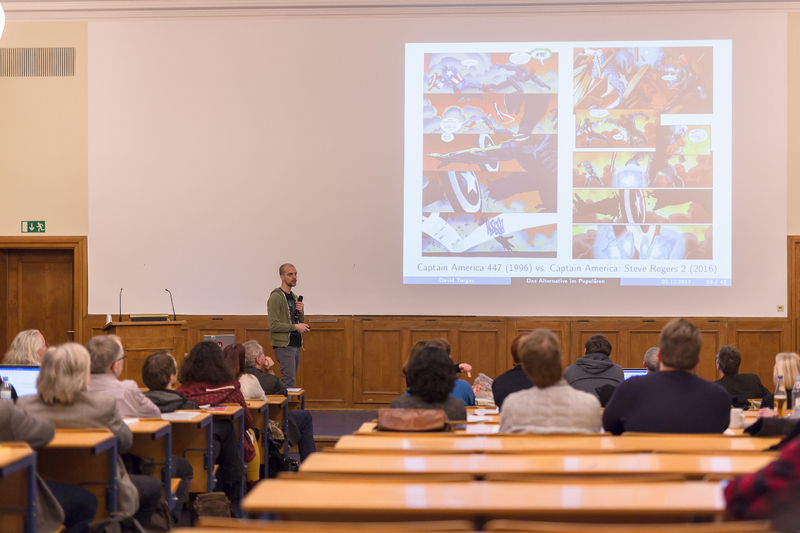 Marco Pellitteri presented results from a survey on the arrival and impact of manga in several European countries. He attributes the success of manga in Europe mainly to two circumstances: the adoption of the ‘authentic’ tankobon format for translated editions, and the simultaneous broadcasting of anime series on European television channels. Lukas Sarvari introduced three manga drawn by Kazuo Kamimura: Shinanogawa (1973-74, written by Hideo Okazaki), Furious Love (Kyōjin kankei, 1973-74, written by Kamimura himself), and Lady Snowblood (Shurayuki-hime, 1972-73, written by Kazuo Koike). Each of them is set in a different period of Japanese history: Shōwa (1926-89), Edo/Tokugawa (1603-1868) and Meiji (1868-1912), respectively. However, Sarvari’s hypothesis is that these manga tell us more about the time in which they were made than about the time in which their stories are set. Thus they convey views about the nihonjinron discourse, Japanese exceptionalism, and fascism that readers today might feel uneasy about. Christian Chappelow identified similar elements in two manga about Adolf Hitler: Hitler (Gekiga Hittorā, 1971) by Shigeru Mizuki and Adolf (Adorufu ni tsugu, 1983-85) by Osamu Tezuka. Both manga can’t really be regarded as anti-war stories and lack a critical stance against nationalism, militarism and fascism. Chappelow suspects that this is the reason why Mizuki’s Hitler hasn’t been translated into a European language yet.